This week, let’s push a bit beyond the boundaries of standard high school academics and introductory college physics curriculum. 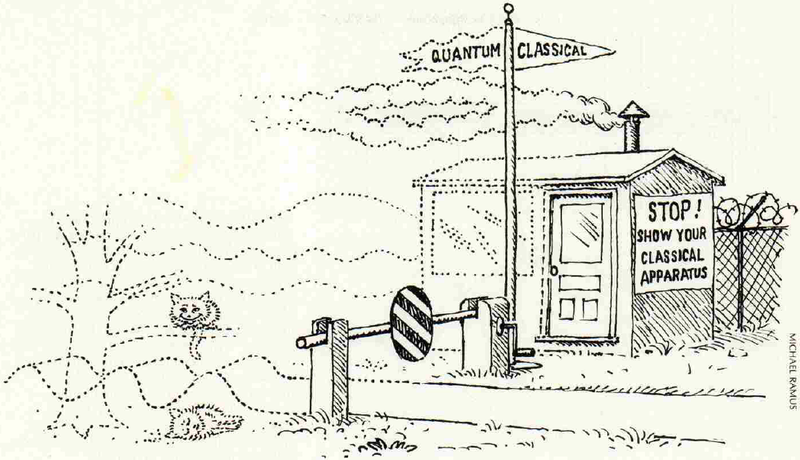 Let’s dive into a topic that demonstrates the beauty and occasional counter-intuitive strangeness of modern physics: quantum mechanics! As a physics tutor and enthusiast, I came across this article recently, and thought that the author raises an interesting point. Essentially, he argues that when physicists invoke the concept of physical measurement to explain the Heisenberg uncertainty principle, one of the most widely known (and most commonly misconstrued) concepts in quantum mechanics, we are doing our audience a disservice. We are glossing over the fact that the uncertainty principle actually represents a more profound truth about the physical world, and, in doing so, we inadvertently encourage misunderstanding. That is a fair point, but it made me think of all the fascinating and counterintuitive ways in which physical measurement does play a role in modern quantum mechanics. Over the next few posts, we will look at a few interesting (and weird!) examples. We can’t know a particle’s position and momentum at the same time. But for now, let’s look at the Heisenberg uncertainty principle and try to understand that article’s point. That bit about “invoke the concept of physical measurement” and “more profound truth” was fairly abstract, so what, exactly, are we talking about? In its most common formulation, the Heisenberg uncertainty principle says that we cannot know a particle’s position and momentum with arbitrarily good precision at the same time. If we know precisely where the particle is, then we must be at least somewhat uncertain about how quickly it is moving, and vice versa. When we explain the principle, we usually follow Heisenberg’s original train of thought and focus in on the “we cannot know.” That is, we cannot measure the particle’s position and momentum arbitrarily precisely at the same time. This thought leads to the commonly used example of trying to locate an atom under a microscope. Measurement is a physical process. We need to interact with the atom somehow to gain information about it; knowledge of its position does not simply come to us. To find the atom’s position, we need to shine light on it and observe the position from which the light is scattered. If we want more precision, we need to use more intense light. Light itself, however, carries momentum, and every photon that scatters off the atom kicks the atom around a bit. The more precisely we measure the atom’s position, then, the more we disturb the atom’s momentum. The same happens when we try to measure its momentum. We can’t win either way. We have come to learn, though, that the uncertainty principle’s interpretation is actually a bit subtler. Placing such an emphasis on measurement implies that the limitation is technical in nature and we might somehow get around it. We might build a better microscope or devise a cleverer experiment, and nail down both uncertainties at last. The reality is that the atom’s position and momentum are not both well-defined at the same time. If we measure the atom’s precise position, we cannot also measure its precise momentum because that exact number does not exist. Wait, what? How can an atom’s momentum cease to exist? This is a very difficult concept to wrap one’s head around, so let’s explain it by close analogy. Imagine two sounds, a sudden snap of the fingers and a long, sustained whistle. Let’s say we want to measure either the sound’s frequency (analogous to the atom’s momentum) or the time at which the sound occurs (analogous to the atom’s position). The snap has a very well-defined time – it happens precisely *snap* now. But what is its frequency, its pitch? Do you snap a B-flat, a C-sharp? The truth is that you need to produce many overlapping sound waves with a wide range of frequencies to produce a single, sharp pulse of sound1. Analogously, if you measure an atom to be precisely *point* here, that atom must have a wide range of momenta. On the other hand, the long, sustained whistle has a well-defined frequency. You are whistling a beautiful, pitch-perfect G, but the note is only well-defined because the whistle occurs over a long duration of time. Similarly, if you know exactly how fast the atom is moving, its location must be smeared out over some extent of space2. This might seem like a semantic distinction, a difference only in the words that we choose to describe the same concept, but the difference is important. It turns out that this difference, between how Heisenberg envisioned this principle and how we think of it today, can be measured experimentally. We actually have done better than the measurement interpretation says we should be able to do. On a more philosophical note, this concept turns a core impulse of science on its head, in a way. Classically (i.e. up until 1900 or so), the mission of physics might be loosely paraphrased like this: Give me a sufficiently precise measurement tool and sufficiently accurate knowledge of the laws of nature, and I will be able to tell you anything you want to know. Imagine the shock, then, when quantum mechanics showed this claim to be false, injecting randomness into nature at the most fundamental level. Einstein himself railed against this idea, famously stating that “God does not play dice [with the universe],” but this aspect of quantum mechanics has been tested countless times over the course of the past hundred years. I hope that you can now better appreciate that article’s point, that we should stop putting measurement at the center of our conception of the Heisenberg uncertainty principle. Measurement does, however, play a fundamental role in several other fascinating and counter-intuitive quantum mechanical phenomena. Next time, we’ll explore exactly what we mean by a quantum mechanical measurement and then we’ll move on to see some of these examples. Stay tuned! 1 This method, comparing the duration of a sound with the frequency components that make up that sound, is Fourier analysis. According to Monsieur Fourier, any function can be constructed from sine waves of different frequencies and amplitudes. To construct a sharp peak (snap), you need to overlay many sine waves with a wide range of frequencies. To construct an infinitely long sine wave (whistle), you only need that one sine wave. 2 We won’t get into what it means, in a deep physical sense, for an atom to be “smeared” across some extent of space like paint on a canvas. For the time being, recall from chemistry that the orbital of an electron in an atom can be thought of as a kind of precisely shaped cloud. The “smear” and the “cloud” are exactly the same presently ill-defined concept.